Rent a beautiful multi-family house on the sea, with direct and private access to the beach. We have more apartments on the same floor for families of friends who want to spend their summer holidays together without giving up their privacy. Large terraces with suggestive sea view. Modular living room complete with every comfort and comfortable sofa. Toilet with shower. Rooms with large closets. Washing machine. Armored doors and double glazing fixtures. Parking spaces and outdoor shower in a large fenced garden. Located in a private village with inside a supermarket, bar-pizzeria. 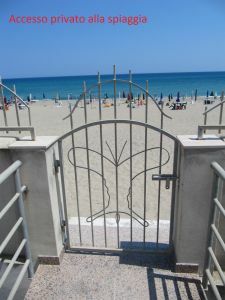 In addition 'having access to the village only residents and renters, just arrived you can place your umbrellas, sunbeds, toys for children on the beach, in front of the house without having the thought of bringing them back with you every time. It will be enough to go down the stairs or turn the corner to the ground floor in costume, everything will be more comfortable and will give you that sense of tranquility and well-being, the true sense of a holiday. Prices vary depending on the months when you decide to stay. PS.It is always better to make a direct telephone contact to satisfy every request.